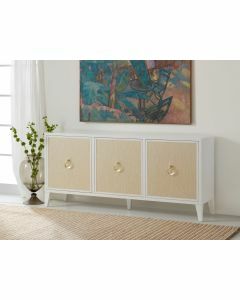 The Riviera Two Door Credenza features intricate rattan door fronts. It is highlighted by brass accents and has a white painted case. It measures 54”W x 17”D x 35”H. Click on image for greater detail. This item ships via motor freight. Freight charges are estimated and subject to change. Additional fees and transit times may incur. This item is custom made to order. It may not be returned unless there is damage or defect incurred during shipping and transit. Please note that shipping time varies on this item. Lead times can be 18-20 weeks, though sometimes the items are in stock. Please contact Customer Service to confirm the exact delivery time of your item. We also have a price match guarantee. If you see this item listed elsewhere for less, please let us know! 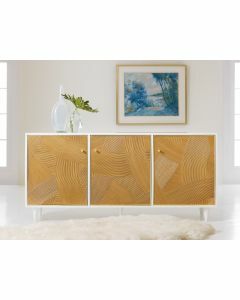 If Free Shipping is noted, it is part of a promotion that we are offering as a courtesy to our customer. However, customers are responsible for reporting any damage to the item incurred while shipping immediately upon receipt of the delivery. Custom made items may not be returned. Please consult our Return Policy for complete information. 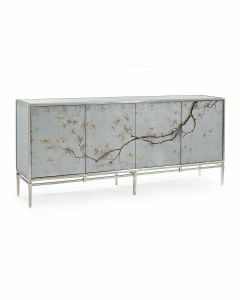 Designers please join our trade program for discounts on this item. Usually ships within 8-10 weeks.